Russian airstrikes against terrorists in the Syrian provinces of Idlib and Homs will have a strong psychological effect, said Russian parliamentarian Franz Klintsevich, First Deputy Chairman of the Committee on Defense and Security at the Federation Council. Earlier this week, during President Vladimir Putin’s meeting with the military command, Defense Minister Sergei Shoigu reported that the Russian Navy launched Kalibr cruise missiles against Daesh positions in Idlib and Homs. "I believe that airstrikes by the Russian Aerospace Forces backed by the Russian navy against terrorist targets in the provinces Idlib and Homs will also have a profound psychological effect. This will facilitate the liberation of Aleppo where the Russian aviation will also be involved," Klintsevich said. On Tuesday, Shoigu said that the Russian frigate Admiral Grigorovich hit terrorists in Syria with Kalibr cruise missiles. "Today, we started a large-scale operation on launching massive strikes on Daesh and al-Nusra Front targets in the Idlib and Homs provinces," Shoigu said. "Frigate Admiral Grigorovich takes part in the operation. Today, it launched Kalibr cruise missiles on targets that had been confirmed by intelligence data and determined in advance," Shoigu said at the meeting with Putin. On the same the ministry also reported that "for the first time in history of the Russian Naval Forces" Admiral Kuznetsov aircraft-carrying cruiser launched striked on Daesh and al-Nusra Front targets in Idlib and Homs. "The Admiral Kuznetsov aircraft carrying cruiser began taking part in operations for the first time in the history of the Russian Navy. Our Su-33 aircraft began working from this cruiser today. Before this, we carried out very careful, thorough reconnaissance of all targets," Shoigu said. The main targets include ammunition depots as well as plants producing weapons, the minister added. On November 8, it was reported that Russian Navy's aircraft carrier group, which includes Russia's Admiral Kuznetsov aircraft carrier, Pyotr Veliky' guided missile cruiser and two destroyers, had completed its transfer to the Mediterranean Sea and group was getting ready to launch a strike targeting Daesh terrorists in the province of Aleppo. 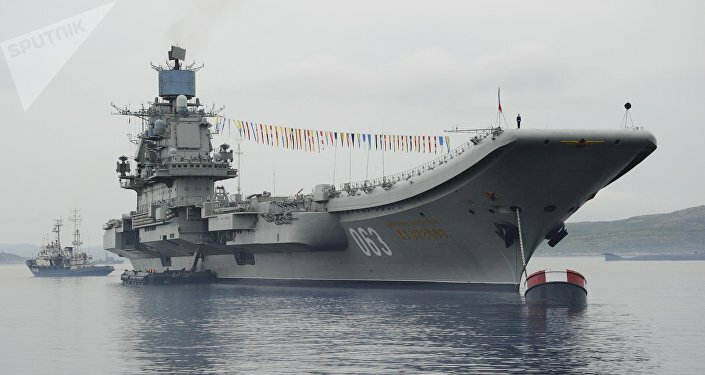 On November 12, the commander of the Admiral Kuznetsov said that sea-based jets of the aircraft-carrying cruiser began training flights. However, so far Russian combat aircraft refrain from carrying out airstrikes in Aleppo to help civilians evacuate from the city. 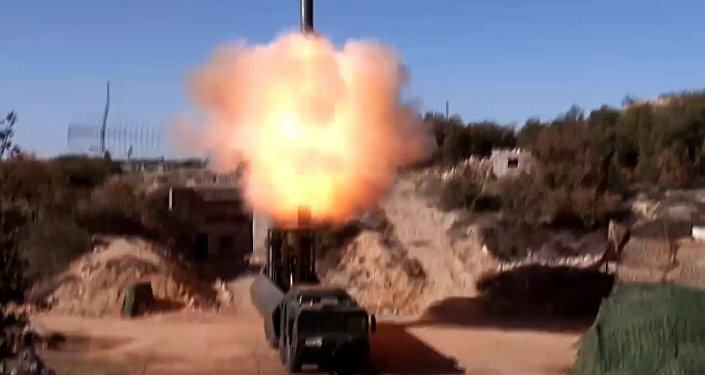 The Defense Ministry also reported that the Russian naval group in Syria was protected by Bastion and Pantsir coastal defense missile systems as well as an S-300 missile defense which was deployed to Syria in October. Moreover, the ministry released a statement saying that Russian Aerospace Forces carried out airstrikes on Daesh and al-Nusra Front positions on Thursday. The Russian air group at the Hmeymim airbase and Su-33 jets from the Admiral Kuznetsov also took part in the strikes. "The targets included terrorist command posts, weapons and ammo depots, various military equipment and weapons production facilities," the statement said. In particular, the ministry reported that at least 30 militants from al-Nusra Front, including several field commanders, had been destroyed by airstrikes launched from the Admiral Kuznetsov. The airstrikes also included Russian Tu-95MS strategic bombers which used cruise missiles against Daesh and al-Nusra targets. The missile carriers' route passed through the North Sea and the Eastern Atlantic, the statement said. Pilots covered 11,000 kilometers (6,835 miles), flying from Russian airbases and performed aerial refueling twice before they reached their combat positions. According to the ministry's statement, Russian strategic bombers launched cruise missiles from an area over the Mediterranean Sea. Once the strike on terrorist targets had been carried out, the Russian Aerospace Forces aircraft returned to their home airbase.